The Vizio E320i-A0 really creates a category of its own, the small screen 720p smart TV. Any other small screen smart TVs out there offer full HD resolution for a significant jump in price. 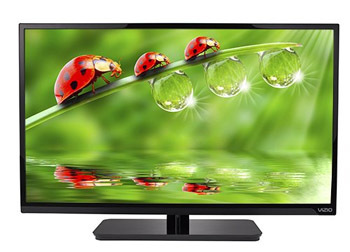 This one can be found for less than $300, making it one of the only budget smart TVs avaliable. It's got the typical 60Hz refresh rate for the size, but that doesn't work against it. The E320 is a variant of the TV that can be found for even less. The E320i and the E320 models are different in one way besides a small difference in price. The E320i features the Vizio Internet Apps while the E320 does not. Both are 720p with a 60Hz refresh rate. The LED backlighting is the reason for a decent picture quality on the E320i. You may not be getting a full 1080p HD picture, but it is hard to see the benefit of a full HD picture on a 32 inch screen. If you want this to be a computer monitor, that's where you will see a loss in performance due to the 720p resolution. The 60Hz refresh rate is another thing not to worry about. Once again, motion blur is going to be hard to spot on a TV of this size. This TV has a dynamic contrast ratio of 200,000:1 and 16.7 million colors to make for great picture reproduction. Vizio shedded the local dimming feature on this model of the E-series. The Vizio E320i-A0 comes with wifi right in the TV so you don't have to worry about finding a long enough Ethernet cable. It connects to the Vizio Internet Apps (V.I.A.) quickly and easily once you scan for an active wifi network. Vizio's smart TV platform gets you to all of the apps that you'll find on a lot of the other smart TV platforms. The amount of apps may not be here, but the amount of usable ones is pretty high. Most of them deal with streaming music and video content, but you'll also find news apps from various sources. You get access to plenty of content apps like Youtube and Netflix. You can also log onto all of your favorite social networks and find news from many different sources. There isn't any fancy gesture control or voice recognition. This can be considered a good thing because voice features on smart TVs are still being perfected. The E320i loses the Razor LED design that many of the E series uses. This means there is a little more depth to the TV than the others. This one clocks in at around 3 1/2" while the Razor design is less than 2". This may make the E320 less suitable for wall mounting. As you can see the bezels are still less than an inch, and that makes for a great look. It's got the standard square black glossy stand. For $288 the E320i-A0 has a lot of value. There aren't many TVs of this size with 720p resolution that feature internet connectivity, so it already has an advantage. Samsung's UN32F5500 sells for close to $400, but it is 1080p. LG's 32LN5700 is available for $450, and it 1080p as well. This makes it one of the best budget smart TVs on the market.